Due May 10, the band’s thirteenth studio set presents 13 new tracks with David Coverdale joined by a lineup featuring guitarists Reb Beach and Joel Hoekstra, bassist Michael Devin, keyboardist Michele Luppi and drummer Tommy Aldridge. Introduced with the lead single, “Shut Up & Kiss Me”, the group have also shared “Trouble Is Your Middle Name” and "Hey You (You Make Me Rock)" ahead of the project’s arrival next month. “Flesh & Blood” will be released in multiple formats, including CD, CD+DVD Deluxe Edition, 2LP sets in various colors, and a Super Luxury Boxset, which will deliver the CD+DVD Deluxe Edition, 2LP, a poster and a numbered lithograph. 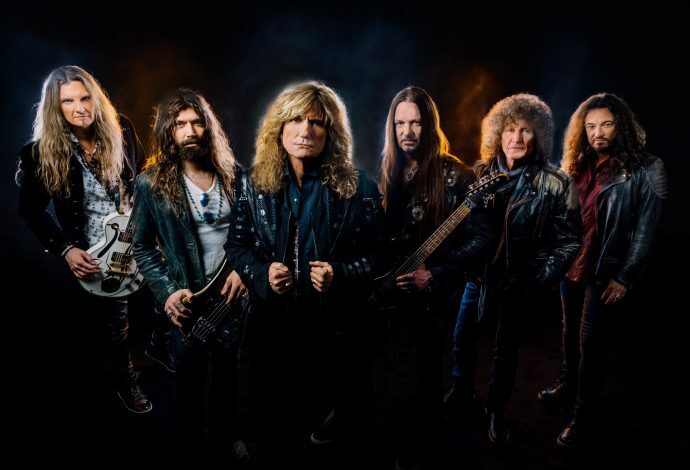 "We are truly excited and looking forward to playing across the globe in 2019 on what will be a continued celebration of the 40th Anniversary of Whitesnake," says Coverdale. "I am so honored and grateful to have toured this incredible world we share, for over 40 years, celebrating and enjoying unforgettable moments with millions of people… All of whom have joined me on this amazing journey. “I truly love the shared experience and simply love my job and always will… Over four decades of reptilian fun! Thank you!"